A historical supernatural mystery from acclaimed indie creator Francisco Gonzalez. I was fortunate enough to have the chance to play a preview copy of the upcoming Lamplight City by Francisco Gonzalez, creator of previous tales like A Golden Wake and Shardlight with Wadjet Eye. Gonzalez, publishing this time under his own Grundislav Games label, positions this retro-styled 2D point-and-click game with the unique elevator pitch of “a detective game where it’s okay to fail.” I was intrigued. Since most people – and I definitely include myself in this category – aren’t on the intellectual plane of Sherlock Holmes or Hercule Poirot, I wondered if that meant the mysteries would be obvious or if I’d have to pay extra special attention to what was going on in true detective style. Interestingly, the answer is neither, at least in the part I got to sample. 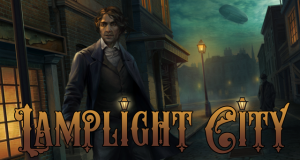 Lamplight City is set in an alternative Victorian era timeline. It takes place in 1844 in the city of New Bretagne, which has more than a passing similarity to New Orleans as represented in Jane Jensen’s Sins of the Fathers. In fact, much of this game seems inspired by the first Gabriel Knight. The map screen for moving from place to place looks very familiar. Dialogs with other characters switch to black screens with detailed, animated portraits and a list of topics to talk about with whomever you’re interviewing. The protagonist wears a long, dark jacket like Gabriel Knight – which is actually joked about in the game. Locations you visit can also be reminiscent of GK, such as the local coffee shop. You even get to ask people what they know about voodoo in a few places. All this is done rather tongue-in-cheek and is clearly an homage to the Sierra fan favorite, especially as the actual content of the game differs significantly (there’ll be no Schattenjägering here). 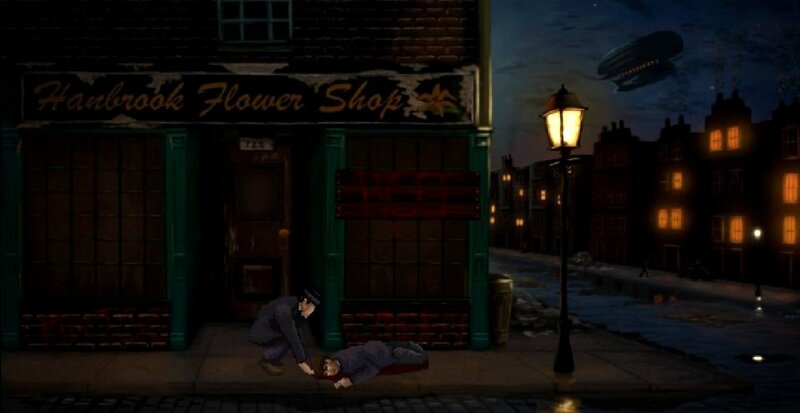 While Gabriel Knight is clearly the biggest influence on Lamplight City, other subtle nods to golden age classics such as Loom as well as some more recent games like the Blackwell series can also be found. Visually, the pixel art is what we’ve come to expect from Grundislav. Every scene and character is beautifully and vibrantly drawn, and the animated dialog portraits are wonderfully detailed. In fact, the game steps up the resolution from the studio’s previous 320x200-esque artwork to 640x480 (or its widescreen equivalent). The increased resolution allows for finer detail while still retaining that classic retro look when viewed on today’s larger screens. In my travels I visited the run-down areas of New Bretagne at night, which was suitably creepy. I made a trip out to the quiet but melancholic cemetery with its many aboveground mausoleums. And I dropped into residences both opulent and humble as I hobnobbed with the different classes of society. Each location is quite distinct and filled with enough background detail to make them feel real without becoming a cluttered mess. I had no difficulty in determining what areas of the screen could be interacted with, even without having to run the mouse over them to get a pop-up labelling what they were. The detail isn’t just present when the game is standing still either. All of the characters move fluidly and their range of animation is greater than in many larger scale productions seen in recent years. Whether it’s people climbing through windows, getting into fist fights (don’t worry, you don’t control the fighting), or dead bodies falling out of unexpected places, they’re all smooth and believable. I don’t want to know what was used as reference for the latter. The story of Lamplight City centers around two detectives, initially working for the New Bretagne police. You control Miles Fordham, the more diligent and serious of the pair. Your partner is Bill Leger, who tags along and offers up the occasional insight, especially when it comes to the city’s societal divisions. Bill hails from Cholmondeley (pronounced Chumley), a lower class neighborhood colloquially known as “the Chum” that everyone seems to be trying to get out of. In the section that I played, it wasn’t mentioned where Miles came from, but the implication seems to be that he is of higher birth. Apart from the class distinctions between rich and poor, society is also fractured by race and sexual orientation. While the game doesn’t focus on these particular aspects for now, they are always present as an underlying tension and possible motivations for people to commit crimes. In this alternate Victorian world, there is also the increasing pressure of “steamtech”, with modern machines displacing people from their jobs. Although the game is set in the 1800s, it resonates well with issues cropping up frequently in present day news headlines. Miles and Bill are a crack investigative team as the adventure opens. They’ve been summoned to a flower shop in the Chum where for several weeks a thief of sorts has mysteriously been entering and stealing flowers even though the proprietor swears the store has been securely locked. I say “of sorts” because the thief is considerate enough to leave behind payment for the flowers taken. This scenario serves as a sort of mini-case that introduces the different elements of the interface as well as setting up the larger overarching story for the rest of the game. Without spoiling anything, this initial investigation does not quite go according to plan. After things fall off the rails, the game fades to black and rejoins Miles and Bill three months later. No longer on the police force, Miles and Bill’s fortunes have taken a turn for the worse – Bill’s in particular, but even Miles is taking nightly soporifics to help him sleep, while also dulling his abilities. Fortunately, a new case is sent their way by an associate still working for the police force. An upper class woman apparently died but the mourners were in for a shock at the funeral when she came to life again and began banging on the coffin. The police presume foul play and have a suspect in custody, but only on the flimsiest of evidence. It’s up to Miles and Bill to investigate to determine who the real culprit is. Great article! I’ve been expecting this game since I had the chance to interview the creator last year.